As big as the great outdoors. Final phase of the Evergreen Heights at Heritage Woods has just been released! Purchase one of these final Port Moody Homes at Evergreen Heights and receive a deluxe upgrade package valued at $20,000 for limited time offer only. See sales staff for details. From the November/December 2007 Westcoast Homes and Design to help promote this spectacular Port Moody real estate development by ParkLane Homes. Evergreen Heights – The final phase of ParkLane’s Heritage Woods development offers luxurious single-family homes situated in the desireable mountainside area of Port Moody. It began more than a decade ago with an ambitious, master-planned development real estate in Port Moody called Heritage Woods. Along the way there were a myriad of awards, including Best Residential Real Estate Development in British Columbia, testament that ParkLane Homes was building something remarkable, something that would endure. More information about Heritage Woods Port Moody Real Estate here. Today the final phase of this ephocal community is nearing completion, with only 12 homes in Evergreen Heights Heritage Woods remaining. Taking advantage of their stunning natural setting, these three and four bedroom, 1800 to 2200 square foot homes with their spacious decks, patios and yards embrace nature, next door to hiking, camping and mountain biking in Belcarra Regional Park and Buntzen Lake Recreation Area, swimming and kayaking at Buntzen and Sasamat Lakes, golfing at Westwood Plateau. Their spectacular mountainside location in Port Moody’s Heritage Woods development, with valley views, surrounded by age-old evergreens, a pristine creek and wild greenbelt sets these homes apart, the ultimate in luxurious living at Evergreen Heights. Featuring traditional or great room plans with dramatic nine foot ceilings on the main floor and vaulted ceilings throughout, they include such high-end finishings as Berber carpet, wood baseboard mouldings and cosy gas fireplaces with cultured-stone hearths. Gourmet kitchens at the Evergreen Heights homes in Heritage Woods offer breakfast islands and sunny eating nooks, shaker maple cabinets, full-height panetries and double stainless-steel sinks. Such top of the line appliances as stainless steel gas ranges, side by side fridges, dishwasher and microwave/hood fans by Frigidaire make these kitchens the perfect place for dine dining and extended family gatherings. Bathrooms at the Evergreen Heights Port Moody homes promise the ultimate in pampering with their soothing deluxe soaker tubs and separate shower stalls, handset tile flooring and contemporary countertops. Linen closets and valuable storage space are another thoughtful touch. Prices of the homes at Heritage Woods Evergreen Heights start at $789,900 and ParkLane, its customers always in mind, has just announced that homebuyers of the remaining Evergreen Heights homes will receive a deluxe upgrade package valued at $20,000. One of the largest and most recognized residential developers in western Canada, the company of ParkLane Homes has been building homes for more than 25 years and in that time has won more than 200 provincial and national awards for building excellence, including Best Builder in BC and Canada. Heritage Woods Port Moody has been described as “the perfect place to rasise kids,” a community with schools, parks, and a social centre, with easy access to Port Moody and Coquitlam. Vancouver is only 40 minutes away by car, with no bridges to navigate and a relaxing 25 minute ride on the West Coast Express. Evergreen Heights at Heritage Woods’ sales centre is at 300 Panorama Place, Port Moody and is open daily form noon to 6pm. For more info about Evergreen Heights, call 604.461.2991 or visit www.parklane.com. Metro Vancouver developers began marketing 3,765 new condominiums and townhomes in the third quarter of this year, with most in downtown Vancouver, Burnaby and New Westminster according to the Real Estate Weekly of Greater Vancouver. A survey, by PricewaterhouseCoopers (PwC) notes that this marks a 29 per cent increase in new strata units coming to the real estate market in Vancouver compared with the second quarter of this year. The report showed that unsold inventory in Burnaby/New Westminster grew from 315 units in early July to 825 units at the end of September. Sales in the Downtown/West End area managed to keep pace with new product coming on the real estate market. Overall activity in the low-rise condomninium market slowed during the third quarter with almost 900 new units entering the real estate market, down slightly from the 1,000 the previous quarter. Average asking prices fro new low rise condos were down slightly during the third quarter, as demand slowed. PwC counted 496 new townhouse units entering the Greater Vancouver real estate market during the third quarter, up 15 per cent from the previous quarter. Sales of new townhouses during this period dropped 45 per cent to 370 units from 695 sales in the previous quarter. As we wish you Happy New Year we have exciting news for all of you who have lately expressed interest in our new 2 & 3 bedroom presale Surrey Enclave and Morgan Heights townhomes. As of tomorrow, January 16th at noon, we are releasing for sale two more blocks of presale Surrey homes in our Phase 4 Enclave Townhouses which include a limited selection of: 2 bedroom Enclave Morgan Heights homes (A4 & A5 plans, 1,236-1,288 sq. ft.) starting at $344,900, 3 bedroom pre-construction Surrey homes (B3 & B4 plans, 1,461-1,491 sq. ft.) starting from $394,900 and 4 bedroom Morgan Heights homes (C3 plan, 1,814 sq. ft.) starting from $469,900. These presale South Surrey Morgan Heights homes already under construction and are scheduled for move-in this summer. The A5 and C3 plans here at the Enclave Townhomes at Morgan Heigths South Surrey real estate market place have not been previously offered so now is your chance to come in and find out what makes them special! The A5 is our largest 2 bedroom presale Surrey homes for sale and similarly the C3 is our largest 4 bedroom home. We also have a small selection of 4 bedroom homes in Phase 3 Enclave Morgan Heights community available from $439,900 that will be ready for move-in mid May. All of the South Surrey townhome floorplans can be easily viewed at our full-information website at: www.enclaveliving.ca. The pre-construction Surrey Enclave Community is already home to nearly 40 families and more are moving in each month. We have now “turned the corner” in terms of both construction and sales. We are now over 50% sold and are well into construction of Phase 4 of the Morgan Heights Enclave Townhome community which is our first phase on the north side of the central greenway. Just to remind you our presentation centre and 3 showhomes are open daily except Fridays from 12-5 PM at 2979 156th Street in South Surrey real estate market. 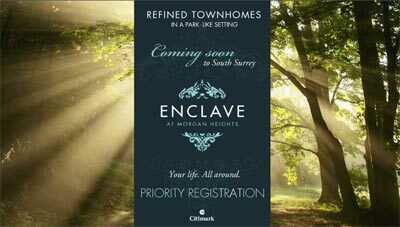 For more information about the new Morgan Heights townhouses at Enclave Surrey development, please visit us or call Mark, Sales Manager, at (604) 657-7500. We look forward to seeing you this weekend! Dear Enclave registrants and visitors, We are pleased to announce that this coming Saturday, November 7th, at noon we are releasing additional 2 & 3 bedroom Surrey Enclave townhomes for sale! Due to strong sales all summer and fall we have almost completely sold out of our smaller A & B Enclave at Morgan Heights townhouse floor plans and have decided to release more of these homes in one of the best locations at Enclave Surrey real estate development. So now is your chance to purchase a deluxe new 2 or 3 bedroom South Surrey townhome in a private residential setting only minutes from a wealth of new shopping and services at Morgan Heights in South Surrey real estate district. The new Surrey Enclave homes just released are in the northwest corner of Enclave (units 99-106) and have a private backyard looking out onto the Morgan Creek protected greenbelt. There are only 8 Morgan Heights homes for sale in this limited release so do not miss out! We have four 2 bed homes (A2 & A3), one 2 bed & den (A7) and three 3 bed homes (B2) now available. Prices start from $334,900. Also we would like to let you know that we have several almost completed Morgan Heights Enclave homes still available in prior phases, including a four bedroom C2 plan (#56) that is priced at $439,900 and will be ready to move into by this January. For more information, please call us at the Enclave South Surrey presentation centre at (604) 542-6200 or Mark, Sales Manager, direct at (604) 657-7500. Of course our full information website is available for viewing any time at www.enclaveliving.ca. The South Surrey Enclave at Morgan Heights presentation centre and 3 showhomes are open daily from 12-5pm except Fridays at 2979 156th Street in South Surrey. We look forward to seeing you this weekend! As summer draws to a close we wanted to send you an update on construction and sales at Enclave South Surrey real estate development. Construction is coming along nicely with our Phase 1 South Surrey Morgan Heights homes for sale already fully occupied and our first Phase 2 homeowners about to move in. Phase 3 of the Enclave South Surrey townhomes for sale is well under construction meaning that the southern half of Enclave community will be fully built out within months. We are very pleased with how Morgan Heights Enclave Townhouses inSouth Surrey real estate market place is progressing and feel that it is the best looking new townhome project anywhere in Surrey! Visit us once again and then shop around and you will see the difference quality makes, both inside and out. Sales here at the South Surrey Enclave Townhouses for sale have been strong all spring and summer. Since releasing Phase 3 we have already sold 12 new Enclave Surrey townhomes! As a result our remaining inventory of available Morgan Heights South Surrey homes for sale is becoming limited and we encourage you to act if you are thinking about living at Enclave Townhouses. The 4 remaining presale South Surrey homes for sale currently available for sale are: Morgan Heights Unit # 51 C1 plan (4 bed, 3 bath, 1,698 sq. ft.) for $429,900, Unit # 56 C1 plan (4 bed, 3 bath, 1,698 sq. ft.) for $429,900, Unit # 35 B2 plan (3 bed, 2.5 bath, 1,461 sq. ft.) for $394,900 and Morgan Heights Unit # 43 A2 plan (2 bed, 2 bath, 1,231 sq. ft.) for $339,900. To see the location of these Surrey homes for sale as well as the Enclave Townhouse floorplans, please go to www.enclaveliving.ca. You can find the Enclave South Surrey townhome site plan and floorplans listed above by clicking on the floorplans link on the left-side navigation tab. If you have not been to Morgan Heights Enclave South Surrey real estate community for a while, be sure to view our 360 degree virtual tours and interior photography. The link is at the lower right corner of the main page. We would like to remind you that our 3 designer showhomes and South Surrey townhome presentation centre are open daily (except Fridays) from 12-5 pm. Enclave is located at 2979 156th Street in South Surrey. For more information, please call the Enclave presentation centre at (604) 542-6200 or Mark, Sales Manager, directly at (604) 657-7500. All of us at the Morgan Heights South Surrey Enclave real estate development sales team hope that you had a great summer and look forward to seeing you soon! Introducing a new ‘classic-modern’ architectural style. Discover a vibrant new neighbourhood in the heart of South Surrey. Set in the newest urban lifestyle village in Morgan Heights/Grandview South Surrey. Rich use of brick, stone and west coast woods. 4 Premium Builders committed to customer satisfaction. For more information about Morgan Heights in South Surrey, please visit www.themorganheightsbuilders.com. 4 showhomes opening mid January and located at 26th Ave and 164 St. in South Surrey. Portfolio of fine homes built on family legacy and craftsmanship by Benchmark Homes Ltd., Park Ridge Homes, RAB, and Wallmark Homes. Dear Enclave registrants and past visitors, We are pleased to announce that due to fantastic sales this summer we are launching Phase 3 of Enclave at Morgan Heights South Surrey townhomes this Saturday, July 25th at noon. In addition to a new supply of our most popular South Surrey homes fpr sa;e from Phases 1 and 2 we are also offering for the first time three new townhouse plans - the A2, A7 and B2. These Morgan Heights Enclave Surrey homes are located at the far western edge of the development and offer a private, park-line yard backing onto a permanent greenbelt. The A7 is our only two bed & den end home and is sure to sell quickly. This is a limited release of 18 new Surrey Enclave townhomes (including 2, 3 & 4 bedrooms over 8 different plans) but the selection of each plan type is quite limited so we encourage you to visit us again very soon to ensure the best choice of plans and Morgan Heights Enclave community locations. Our Phase 3 presale Surrey townhouse prices start at a very competitive $324,900 inc. Net GST. Enclave at Morgan Heights South Surrey real estate development has proven to be a very successful Morgan Heights project due to its quiet & park-like location on a no-through street in the master-planned Morgan Heights community of South Surrey real estate market. Despite its desirable residential location, Enclave townhouses for sale is located mere minutes from the wealth of new shopping & services now open just a few blocks away. In addition to its location, Enclave's high level of interior finish and its beautiful & classic Craftsman architecture have also made it a popular choice. Full information about the South Surrey Enclave at Morgan Heights townhomes can be found on our website at www.enclaveliving.ca. The presale South Surrey Enclave townhouses is located at 2979 156th Street in South Surrey. Our presentation centre and 3 deluxe showhomes are open Daily from 12-5 PM except Fridays. For more information, please call Mark, Sales Manager, direct at (604) 657-7500 or the Presentation Centre at (604) 542-6200. We look forward to seeing you this weekend at Enclave at Morgan Heights South Surrey townhomes for sale. Enclave at Morgan Heights. Your Life. All Around. By Susan Boyce for New Homebuyers Guide, the most trusted source for information about new real estate development properties in the Lower Mainland. South Surrey. Blessed with more annual hours of sunshine than any other area in the Lower Mainland, South Surrey has long been a favourite place to live for homeowners who want the best of the city lifestyle combined with the friendliness of a more rural community. And now there’s an outstanding new real estate opportunity to become part of this vibrant, much loved neighbourhood in South Surrey. For more information about Morgan Heights in South Surrey, please visit www.themorganheightsbuilders.comIntroducing Enclave at Morgan heights in South Surrey. Located near the end of a quiet, residential street lined with mature trees, this exclusive collection of South Surrey townhomes boasts a quality and level of finishing that’s sure to attract the attention of savvy buyers. Every Enclave South Surrey home in Morgan Heights feature is carefully chosen to represent a superior level of quality and refinement. Cabinetry is solid wood with luxurious natural stains, soaker tubs are decadently deep, fixtures and faucets are a sophisticated reflection of the best in contemporary styling. Best of all, what you see is what you get – virtually all the features you’ll fall in love with in the coming display home will be standard at the Morgan Heights Enclave townhomes and townhouses. Outside, you’ll find a welcoming West Coast architecture accented by stone and timbers. Hardiplank siding in rich, heritage colours will create a classic sense of arrival, of presence and solidity. Still, for many, the true piece de resistance is Enclave’s South Surrey central linear park that runs through the middle of the entire length of the community at Morgan Heights. A full 50-feet wide, ehre residents of Morgan Heights Enclave townhomes will find a meandering pedestrian walking path, park benches, and lushly landscaped gardens, perfect for escaping the hustle and bustle of daily living. We would like to let you know that we have just completed our Virtual Tours for the South Surrey Morgan Heights Enclave Townhomes and they are a great tool by which you can remember the project and also show your friends and family our great interiors and rich exteriors. There are 2 ways to get to the Virtual Tours: 1) Go to our main website www.enclaveliving.ca and click on the link at the lower right on the main page; or 2) Click here http://www.seevirtual360.com/themes/1/theme01.aspx?listingID=16641 to go there directly. Once you are in the Virtual Tours page click LARGE VIEWER on the right (just below the Enclave logo) and you can see the large viewer window for these pre-construction South Surrey townhomes for sale at Enclave at Morgan Heights community. The 7 Virtual Tours (all 3 of our showhomes plus an exterior view are included) are accessed by the pull-down menu on the bottom right of the large viewer window. Pre-sales have been strong at Enclave Morgan Heights townhomes for sale in South Surrey real estate market of late and we are now running low on 2 & 3 bedroom homes. At this time we have only two 3 bedroom pre-sale South Surey homes for sale and two 2 bedroom Enclave Morgan Heights homes available. All of these will be ready for move-ins in about a month or less. So the time to act is now. Once these are sold there will be a long wait for Phase 2 Enclave at Morgan Heights South Surrey real estate development occupancies, and when released for sale (likely late summer) we anticipate higher prices. The pre-sale Enclave townhome's current value pricing, in combination with very low interest rates and a dwindling selection of 2 & 3 bedroom South Surrey homes for sale means that now is the best time to consider purchasing at Enclave at Morgan Heights community if you are in the market for a beautiful new & ready to move into your new South Surreytownhome. Enjoy the tours and we hope to see you soon at Enclave! The Enclave Sales Team - Mark, Janny and Grace. For information, please call Mark Manuel, Sales Manager, direct at (604) 657-7500 or visit the website at www.enclaveliving.ca. The South Surrey Enclave Townhomes at Morgan Heights real estate development is located at 2979 156th Street in South Surrey and is open for viewing daily 12-5pm (except Fridays). The Sales Centre phone number is (604) 542-6200. For sheer convenience, Enclave South Surrey townhomes is a winner too. Just a ten-minute walk or two-minute bike ride away is the brand new Morgan Crossing Centre where you’ll find boutique style shopping, coffee bistros, and a quaint village ambiance. Venture a few minutes farther, and you can be browsing the big box retailers of Granview Corners or South Point Centre. Or, if you’re ready for a day exploring the offerings of Bellis Fair or Seattle, it’s just a two minute hop onto the freeway and you’re US bound. And don’t forget the sandy beaches of White Rock and Crescent Beach are perfect for seaside walking in all four seasons near your Enclave townhome in Morgan Heights South Surrey. Plus there are schools, parks, recreational facilities and a host of restaurants ranging from grab-and-go snacks to and evening of romantic lingering with your significant other. Enclave townhomes in Morgan Heights also has a treat for cyber-savvy buyers. When the presentation centre opens, you’ll be able to explore the homes and site itself via photo-realistic, 3D renderings and virtual tours. It’s just another way Enclave Morgan Heights in South Surrey raises the bar on quality and service. The Morgan Heights Enclave town home development offers a total of 129 townhomes in 15 different two, three and four bedroom floor plans that range from approximately 1200 to 1700 square feet. Prices are anticipated to start in the high $300,000s. Enclave townhouses is located at 2979 – 156th Street in Surrey. To priority register, please visit www.enclaveliving.ca or call 604.542.6200. Morgan Heights Enclave townhomes sales are expected to begin early in the New Year. Dear Enclave Registrants & Visitors, Great news! South Surrey's best townhouse real estate release at Morgan Heights value just got better! Enclave Townhouses is holding a limited time only pre-construction pricing Summer Sales Event on all remaining unsold Phase 1 homes. This is your chance to purchase a new South Surrey home at Enclave, located in the master-planned new community of Morgan Heights in beautiful South Surrey real estate industry, for a great price. Without a doubt Morgan Heights Enclave new townhomes is the best new pre-sale home buy in the South Surrey market. We encourage you to compare as we are confident that Enclave town homes offers you unmatched value and quality: Great selection of 2, 3 & 4 bedroom preconstruction townhomes available ranging in size from 1,220 to 1,725 square feet. High end interior finishes including: granite countertops in kitchen & ensuite bathroom, tiled kitchens, Whirlpool stainless steel appliances including gas range and 22 cu. Ft. refrigerator, laminate flooring throughout the main floor, and three designer colour schemes to choose from. The Morgan Heights master planned South Surrey community release of Enclave townhomes provide striking craftsman-inspired, richly detailed architecture. Quiet residential location on tree-lined no-through road. Morgan Heights Central Greenway with the Enclave Clubhouse as its showpiece. Enclave townhouses provide close proximity to all the new shops and services at both Morgan Crossing and the Grandview Corners. Easy access to Highway 99 for commuting. The current south Surrey enclave townhome pricing sale includes: 2 bedroom between 1,222-1,308 sq. ft. from $324,900, presale 3 bedroom between 1,459-1,498 sq. ft. from $369,900 and Enclave 4 bedroom townhomes between 1,698-1,725 sq. ft from just $424,900. We currently have a great selection of 2, 3 & 4 bedroom new South Surrey townhomes that will be ready for occupancy starting from this fall and throughout early 2009. Our website located at www.enclaveliving.ca has complete information including floorplans, site plan for Morgan Heights South Surrey real estate, feature sheet and much more. We encourage you to visit new Enclave townhouses very soon to take advantage of our Summer Sale event. Our Enclave Morgan Heights presentation centre is open daily (except Fridays) from 12-5 pm and is located at 2979 156th Street in South Surrey. For those of you who have not yet visited us, the Enclave website has a “directions” page which will help you to easily find us. We would like to thank you for your continuing interest in Enclave real estate in South Surrey and hope to see you soon! There is so much to tell you about the progress of our development, Morgan Crossing! Our new building, Central at Morgan Crossing, has freshly designed display suites with unprecedented pricing for the South Surrey area (rumoured to start at $244,900). We will be booking appointments to preview this fantastic urban centre mid-March, releasing the units for sale at the end of March. With over 130 retail shops and restaurants (Steve Nash Fitness, Best Buy and Thrifty foods, to name a few) as well as numerous others within walking distance, this area will be the new pulse of activity for South Surrey. Additionally, you would have the opportunity to purchase a Morgan Heights South Surrey home before demand dictates prices to increase! The entire development is due to complete in the Spring of 2010! I would like to call you at the beginning of March to book an appointment to preview the newly designed display suites at South Surrey's Morgan Crossing. Please let me know if you are interested. In the meantime, watch for our promotions that will give you more details. Thank you! Your Home and your style are here at the Enclave Townhomes in Surrey. Zac G wrote this article for the recent New Homebuyer’s Guide. Deep in the heart of South Surrey, surrounded by an abundance of mature trees and parkland, is a charming new pre-construction real estate Surrey neighbourhood called Morgan Heights. This exclusive, master planned community has quickly become one of the most desirable destinations in the Lower Mainland and will soon welcome its latest real estate launch, Enclave at Morgan Heights neighbourhood. Phase 1 of Enclave townhomes opens mid-May, featuring refined pre-sales townhouses set against the lush backdrop of a tree-lined, no through road. A beautiful life is awaiting prospective home buyers at this Surrey Morgan heights neighbourhood of exclusive townhomes in Enclave neighbourhood. Complementing its serene surroundings, the architecture at Enclave townhouses is classic West Coast, blending traditional heritage styling with contemporary finishing. Nature plays a prominent role in the exteriors, where there’s an extensive use of wood accented by cultured stone to complement the Hardi siding, shingle and panelling. There’s also there exterior colour schemes for these homes at Enclave Townhomes at Morgan Heights, a new development in the Surrey real estate property market, adding a customized feel to architecture that already includes unique touches like bay windows, gables, rafters and trellises. With fifteen different Morgan Heights Enclave townhome floor plans, ranging from two to four bedrooms and each with two car garages, along with three interior colour schemes to choose from, there’s an abundance of options at Enclave town homes. The finishings are top notch, stating with the kitchens tha feature solid wood shaker style cabinest, double edge granite counter tops, full height tile backsplshes, and a deluxe stainless steel appliance package. Along with a gas range and pull out veggie sprayer, this is an inspiring spot to prepare a gourmet meal at your private townhome at Morgan heights Enclave homes. The efficient floorplans and oversized nine foot ceilings on the main floor maximize space and create an open feel. Each Morgan Heights home at Enclave Surrey real estate comes with at least two luxurious bathrooms, including the ensuites which have tile flooring, radiant in floor heat, granite countertops, and polished chrome faucets. Custom tile bathrub shower surrounds makes this great spot to relax. Large yards at the Enclave Townhomes Surrey property and spacious decks and patios embrace the outdoors. When not enjoying the outdoors, the Enclave Clubhouse will include a gym, kitchen, fireside lounge and meeting spot exclusive to residents. Despite the natural surroundings and relaxed lifestyle, residents at Enclave Townhomes will make no sacrifices when it comes to convenience. All major amenities are within walking distance, including the Morgan Crossing lifestyle centre and the big box stores of Grandview Corners. Pre-construction Surrey Enclave Townhomes is an ideal location for families, with existing schools nearby, new ones in the planning stages, and acres of parks and numerous trails around the corner. Whether planning a day in Vancouver or a shopping trip across the border, Enclave new construction town homes in Surrey’s Morgan heights is close to major commuting highways. Affordably priced from $359,900,this is the first phase of Enclave townhome’s collection which will eventually feature 129 Surrey pre-sales homes in Morgan heights. The grand opening of Enclave is May 17th at noon and the real estate development is located at 2979 156 th Street. For more details, please visit www.enclaveliving.ca or call Mark Manuel, Sales Manager at 604.657.7500. Enclave Surrey Town Homes is holding its Grand Opening on May 17th and will be thereafter open Daily from 12-5 PM except Fridays. We invite you to come down to view Enclave Townhomes in person and see why its South Surrey's most sought after new townhome community. For more information, email us at info@enclaveliving.ca or call the presentation centre at 604-542-6200. For immediate response please call Mark Manuel, Sales Manager, at 604-657-7500. Enclave is located at 2979 156th Street in South Surrey real estate. Thank you for your interest in Enclave and we look forward to seeing you soon! Beautiful Townhomes in South Surrey Now Selling! The Enclave at Morgan Heights is launching their new grand re-opening November 1st, 2008. The designer Enclave townhome showhomes are now open in South Surrey real estate market. With two to four bedrooms townhouses for sale, these South Surrey Enclave homes are priced as one of the most affordable Surrey townhome developments ever. The two bedroom Enclave at Morgan Heights townhomes are priced from just $324,900 while the three bed units are from $369,900 and four bedroom large townhouses are from $424,900 at this point. Superior floor plans, finishing and location at a great price in South Surrey. Only 129 pre-sale South Surrey townhomes are for sale at the Morgan Heights Enclave community which features layouts between 1222 and 1498 square feet in size. In addition, with an ideal location just next to the Morgan Crossing Centre, you’ll find tonnes of new boutiques, shopping, dining options just next to your Enclave townhome at Morgan Heights. Not only that, this new South Surrey townhome real estate development is next to South Point Centre or Granview Corners big box retailers in addition to tonnes of golf courses and the beaches of White Rock. Refreshing interiors that feature things like white cabinetry, master ensuites that are large and sumptuous, garages, professional landscaping, formal foyer and plywood construction are other added features that make the new South Surrey Enclave townhouses at Morgan Heights such a great investment. With mature trees outside, West Coast construction architecture with ledgestone, HardiPlank and rich colours, the Morgan Heights Enclave townhomes community is truly coming to form now with eventual completion and move-ins for first time homebuyers and owners before the end of the year, so there is simply no waiting to find that your new home has been cancelled or put on hold like many other developments this year. We are pleased to announce that as of this Saturday, November 1st Morgan Heights Enclave's deluxe new showhomes will be open for viewing! We know that you have been awaiting this day and its finally here - your first chance to see first-hand Enclave's beautiful exteriors and richly finished interiors of the Enclave Townhomes in South Surrey real estate market. We are displaying our B5 3 bedroom end townhome and our A1 2 bedroom interior Enclave at Morgan Heights townhome. They feature two of our designer interior colour schemes - Hazelmere and Meridian. Its hard to choose which one is better, they are that good! We are quite sure that once you have seen Enclave at Morgan Heights South Surrey townhomes in person you will find that it offers the best combination of location, price and finish in the South Surrey area. We also want to let you know that we have 5 two and three bedroom new Surrey homes with occupancy this fall. So if you want to make your move soon, be sure to place Enclave high on your list. Prices at Enclave Morgan Heights townhouses start at $314,900 for our 2 bedroom, 2 bath A1 plan that features 1,222 sq. ft. of well finished space. In case you are looking for more room we also have a good selection of 3 & 4 bedroom pre-sale Surrey townhomes as well. Enclave South Surrey townhomes is open Daily 12-5PM except Fridays and is located at 2979 156th Street in the Morgan Heights area of South Surrey. For more information please call us at (604) 542-6200 or (604) 657-7500 and also be sure to check our our website located at www.enclaveliving.ca. We hope to see you soon at Enclave! Located in the neighbourhood of South Surrey’s Morgan Heights community at 2979 – 156th Street, these luxurious townhomes present three levels of pure West Coast architecture accentuated with timber accents, ledgestone, and covered front porches. Upscale elegance including solid wood cabinetry, Whirlpool appliances (Gold Series), art niches, main floor powder rooms are all standard features at the Morgan Heights Enclave townhomes for sale in the South Surrey real estate market. Fireplaces in a choice of traditional or playful mosaic glass tile in rich orange and burgundy are at the homeowners choice. Right now, the pre-construction Enclave at Morgan Heights townhomes offers a range of two three and four bedroom floor plans. The property perks of this South Surrey real estate development at Morgan Heights Enclave townhouses include: location on a quiet cul-de-sac but walking distance to Morgan Crossing Centre, and only a short ride to Granview Corners, South Point Centre, or the White Rock Promenade. Easy access to schools, parks, and recreational facilities make this an ideal setting for growing families. The price point of the Enclave Townhomes at Morgan Heights in South Surrey real estate starts from $324,900. Enclave Townhomes Features Only the Finest Ingredients – On Sale Now! The Morgan Heights Enclave townhomes have just opened their two new showhomes. With so many new homes for sale throughout the Lower Mainland, we know that deciding which home to buy is difficult. Here are some of the special ingredients put into each pre-sale Morgan Heights Enclave homes that make Enclave the smart choice for you. The Very Best Location: Although Enclave at Morgan Heights is in the heart of this master planned community, it doesn’t feel that way. WE’re located on a quiet no through road surrounded by large trees and away from all the other real estate Surrey developments around Morgan Heights. But you are still just mere minutes from a wealth of new shoping and other amenities available to you. True West Coast Living: Enclave at Morgan Heights townhomes for sale in the South Surrey real estate market exteriors could easily fit in at Whistler Village with its striking craftsman style architecture and designer colours. Large Selection of Floor Plans: The pre-sale South Surrey Enclave townhomes at Morgan Heights features 15 different layouts ranging from 2 to 4 bedrooms, sot here is a plan just right for almost every family. High End Interior Finishes: Enclave townhouses at Morgan Heights South Surrey real estate market interior finishing is second to none for the price. We are confident that you will see the difference that quality finishing makes! At prices starting from an attractive $314,900, the pre-sale Enclave South Surrey townhomes at Morgan Heights is the smart choice. But don’t take our word for it. Come in and see for yourself. 604.542.6200 or www.enclaveliving.ca or 2979 156 Street in South Surrey (open 12 to 5 except Fridays). Two bedroom Enclave townhomes from $314,900 while three bedroom pre-sale South Surrey townhouses start from $359,900. Four bedroom Morgan Heights townhomes start from $409,900. Dear past Enclave visitor, for those of you who have not been to Enclave at Morgan Heights townhouses for sale lately you will be pleasantly surprised at the on-site construction progress. Phase One of the South Surrey townhome project is expected to be completed in April and the first residents have already started moving in. We would like you to know that we have a good selection of 2 & 4 bedroom pre-sale South Surrey homes for sale still available with occupancies starting as soon as March. Prices for our A4 Enclave Morgan Heights homes for sale (2 bed, 2 bath with private walk-out backyard) start at an affordable $319,900. Prices for our C1 & C2 presale South Surrey homes for sale (4 bed, 3.5 bath facing the Enclave Greenway) start from $409,900. And for a limited time only we are including net GST in the purchase price of these new Morgan Heights town homes. Take advantage of the 40 year low interest rates and move into your dream home within weeks! Many of you have already had the chance to view our first two South Surrey Morgan Heights Enclave townhome showhomes and we are confident that you were impressed by the quality and the high level of finish. We are pleased to announce that we are unveiling our deluxe C2 four bedroom showhome this weekend, February 21st & 22nd. This new Enclave at Morgan Heights showhome is dressed to impress in its subtle traditional colours and furnishings. We are extremely pleased with how good it looks! The double-height entry lobby and the open concept have been a big hit to those who have taken a sneak peak inside. Sales of these South Surrey houses have been brisk in the last two weeks with two more families choosing Enclave as their next home! We would like to invite you to come and see our new Morgan Heights Enclave showhome this weekend. You'll discover why Enclave is the best value in the South Surrey townhouse market, combining a very high level of finish, interior and exterior, with an unmatched location on a no-through road mere minutes from a wealth of new shopping and services. Sincerely, The Enclave Sales Team - Mark, Grace and Janny. For more information please call the South Surrey Enclave Sales Centre at 604-542-6200 or Mark, Sales Manager, direct at 604-657-7500. Enclave Townhomes Surrey houses for sale is open Daily (except Fridays) from 12-5 PM and is located at 2979 156th Street in beautiful South Surrey.